Today we are going to Scarborough. We visited this seaside resort in the early 1980’s. 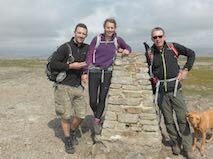 We had not been together long and it was on one of our first trips away, we have not been back since. So this is a bit of a nostalgic return. We walk around under the Castle walls, it is difficult to see how this Castle was taken, but during the English Civil War it changed hands between the Royalists and the Parliamentarians seven times. From our vantage point we get a fantastic view of the resort of Scarborough. 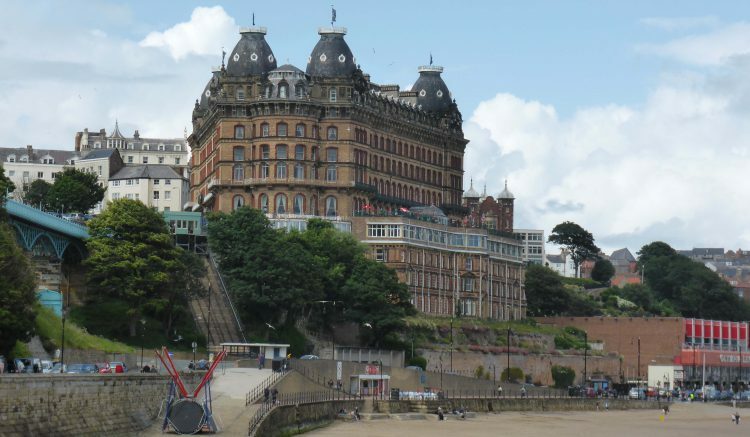 It is said that back in 1626 Elizabeth Farrow discovered a stream of acidic water running from one of the cliffs and this gave birth to Scarborough Spa. The resort grew in popularity and in 1845 was connected to York by the railway. This resulted in an influx of visitors. 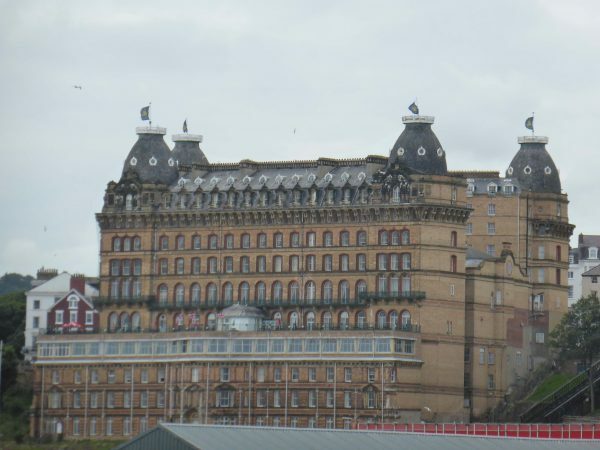 Our view is over the harbour and towards the impressive Grand Hotel standing prominently above the beach. At the time of its completion in 1867 the Grand Hotel was one of the largest hotels in the world and had four towers representing the four seasons, twelve floors representing the months, fifty-two chimneys representing the weeks, and originally three hundred and sixty five bedrooms representing the days. From a distance it still looks an impressive building. We wander down to the harbour, a lovely spot spoilt by the children’s amusement park located by the entrance. 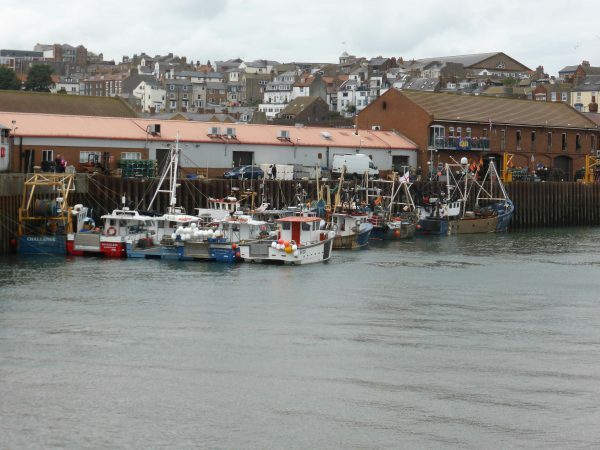 There is still an active fishing industry here, but much of the harbour has been developed into a marina, obviously seeking a larger catch. An information board tells how in the late 1800’s the artist Frederick Booty captured the harbour in his paintings. Of course in those days he would have not had to tolerate Kylie attacking his eardrums whilst he worked. Interestingly Booty was also the author of the first postage stamp catalogue. The original lighthouse on the harbour was destroyed by a German bombardment in 1914 and rebuilt in 1931. From the harbour we walk along South Bay esplanade. This is the type of walk that Dexter and Crosby dream about. 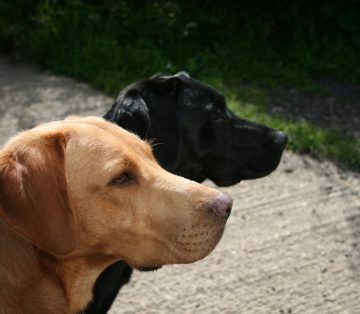 Along the way there are all sorts of tasty morsels that have been dropped, including chips, batter and ice cream, they could happily just wander up and down here all day. There are some interesting sights. Often when you see a TV drama or comedy sketch it appears that some characters are portrayed in an exaggerated way, a walk along Scarborough esplanade and you realise that reality is far more outrageous than fiction. Four ladies of mature years wearing pink tutus were a typical example. 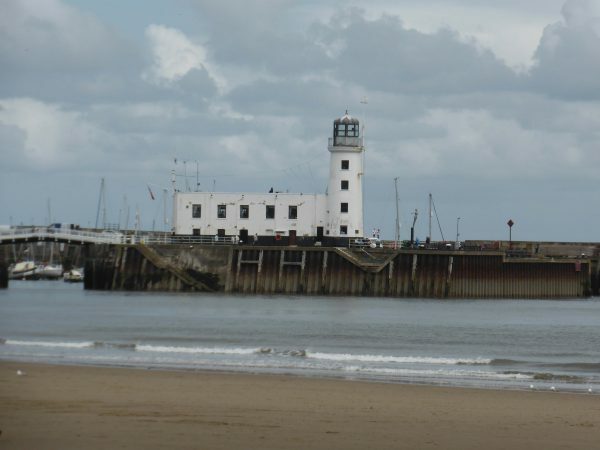 During our many years together there have been a number of incidents that have caused Lynnie to collapse in hysterics, most of which I will not share with you to protect my reputation, however, one of the first was on Scarborough South Bay. It was beautiful sunny day and being a romantic I suggested that we should relax in deckchairs on the beach. Putting up a deck chair is a simple task, all the bits are attached and you just need to get them in the right place. Unfortunately in my youthful eagerness to impress my new girlfriend I rushed the job and ended up in a right tangle. Obviously not easily forgotten, for the last thirty years every sighting of a deckchair on a beach gets Lynnie chuckling. There are donkeys on the beach. 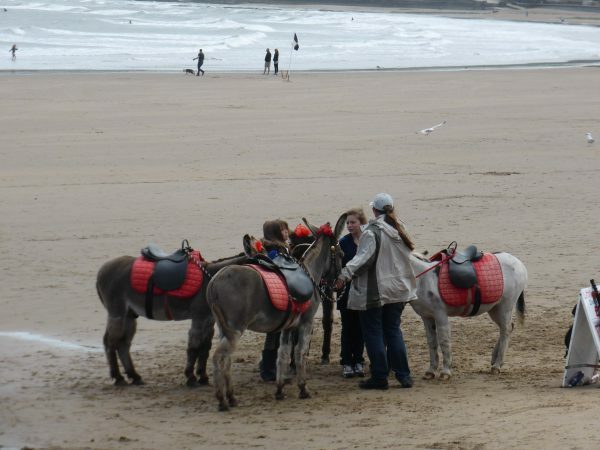 In fact there are probably more donkeys on the beach than people. A ride up and down a very short stretch of sand costs a couple of quid, I assume that some pay this but I wonder why. Seeing the donkey rides reminds me of another favourite joke about a lad having a day out with his grandfather. Unfortunately, not a joke to be shared on this blog, “nay lad nay”. South Cliff Lift, opened in 1873, is said to have been the first funicular railway in the United Kingdom, this and the Central Tramway are the only two remaining operational in Scarborough from the five original lifts. We climb through the gardens to the top of the cliff. Lynnie is looking for the part of the gardens where we strolled one autumn evening along an attractively lit pathway. I tell her that it is not on this bit of beach, but she insists we keep looking. We cross the bridge between the parks and come out by the entrance to the Grand Hotel. A quick step inside the hotel and amongst the posters for bingo and dances you can see the signs of past glory. A blue plaque outside says that Anne Bronte lived in a house on the spot of the Grand and died there in 1849. When we return to the car park we find that Anne Bronte’s grave is in this very churchyard. Driving out of Scarborough we spot a park with lights hanging from the trees, could this be the romantic spot that Lynnie remembers? Indeed it is. 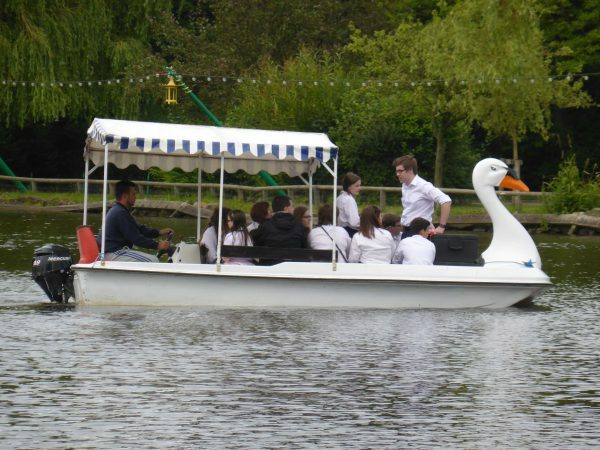 We have just missed the band playing on the bandstand in the lake, they are loading up to return to shore. We wander through Peasholm Park and reminisce. Peasholm Park is a lovely spot. An oriental themed park that opened in 1912. In 1911 Scarborough Corporation purchased some land from the Duchy of Lancaster to create a public park. The land was called Tuckers Field and the borough engineer, Harry W Smith, had the idea of creating a Japanese Style garden. The effect is stunning and it is an oasis of tranquility. For the last eighty years three times a week during the summer there is a naval battle on the lake lasting half an hour. This and the bandstand explain all the seating on the lakeside banks. We will have to return to Scarborough to spend more time here, I don’t think I can afford to wait another thirty years. Time to return to the Unicorn and think about packing up, we are on the move again tomorrow. When I was little no visit to the seaside was complete without a donkey ride (I suspect the going rate was about 6d then). I had a thing about donkeys & still do. I was never sure why I wasn’t allergic to them when the merest proximity to a horse would have me sneezing, wheezing & rubbing my eyes. It was only fairly recently that I discovered that these two beasts have completely different hair, the donkey’s hair is not at all waterproof so they have to be kept under shelter to prevent them getting pneumonia.